What better way to give yourself a boost than going for a walk. Even better, Luxembourg has several “remembrance hikes”. Whether alone or in a group, these are not just good for mental and physical health, they also help deepen understanding of important historical and political subjects, such as war and oppression. None of the way-marked walks are too strenuous or too long, and they take quiet back roads, forest trails, and hiking routes. These landscapes bear witness to history, with the violent events of the past contrasting with the tranquillity of the countryside. Information panels reveal the stories of these fields, forests, hills, and man-made remains. You will have the chance to appreciate the natural grandeur, whilst reflecting on the ideological roots of the tragic events that took place here. The freedoms we enjoy are in no way guaranteed, and exploring these paths helps us to understand these realities more deeply. We can suggest five remembrance walks in the most spectacular regions in the Grand Duchy, as well as a stroll though Luxembourg City. You can book a guide for many of these tours. During the Second World War, “passeurs” helped people flee the country to escape persecution, particularly forced enrolment into the German army. In this region, passeurs used secret pathways through the Ardennes forest into Belgium. We can retrace a “Passeurs Path” on two loops of a circular way-marked walk in and around Troisvierges. The Nazi terror reached its peak in 1942. The hunt was on for members of the resistance, young people resisting punishment for evading forced conscription, and those who offered shelter to fugitives. There were many more political refugees than suitable hiding places in out-of-the-way houses and farms. Thus from early 1943, several patriotic movements started to organise escape routes into Belgium where the German military regime was slightly less strict. Several of these (more or less safe) routes were known to young people of the region who used these to help people escape. One can only imagine their bravery, as each operation to save completely strangers risked punishment by death of passeurs, fugitives and their families. Leaving Sassel, the path goes by Troisvierges, crosses a railway line, enters Biwesch forest, before crossing the border which is marked by a small, well-hidden stream. It ends near the “Red House”. The “Passeurs Path” is an excellent example of how fluid national borders are in this region. A digital guide of natural parks features GPS and audio-visual clips to help walkers explore the two loops of this path. These can be hired from Tourist Info Troisvierges or Troisvierges railway station at 4, rue d’Asselborn. It is difficult to imagine that the magnificent Ardennes countryside has such a painful past. 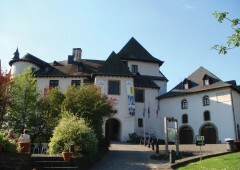 Taking the CFL way-marked walk (accessible by CFL train) from Troisvierges to Clervaux brings you to the majestic Cinquefontaines convent, which overlooks a gentle, picturesque valley. Built by the Society of Priests of the Sacred Heart religious order in 1903, the building was confiscated by the Nazi occupier in 1941. Until 1943 it was used as a holding and transit camp for 430 old and infirm Jews destined for eastern European ghettos and death camps. In total, 1,200 Jewish men, women and children were interned, with almost all eventually being put to death. Only about 50 survivors returned after the war. A monument to their memory has stood on this spot since 1969. The way-marked walk continues deep into a forest. It brings you to another relic of past conflict: the remains of a crashed British Lockeed-Hudson aeroplane. The plane was shot down on the night of 20/21 March 1945. It carried four Royal Air Force crew members who were taking three Belgian secret agents to be parachuted behind German lines. Poor weather conditions led to the cancellation of “Operation Walnut”, and the plane changed route toward Tempsford airforce base in England. The route ends with a strong statement in support of peace and fellowship: the “Family of Man” photography exhibition. Featuring 503 photographs from 273 artists from 68 countries, this collection was originally brought together by the Luxembourg-born American Edward Steichen for the Museum of Modern Art in New York. It has been listed by Unesco as Global Intangible Heritage. This path of remembrance takes walkers past the Schumann's Eck woods where many American and German troops fought and died during the 1944-1945 Battle of the Bulge. You can still see the foxholes that they used for protection, and the battlefield and context is explained by numerous information boards. The surprise German counter-attack through the Ardennes forest in late 1944 had pushed the front line back towards Bastogne, in Belgium. General Patton’s 3rd army held firm. He then sought to regain the losses, aiming to encircle the elite German troops with a move towards the strategically important “Schumann crossroads”, located near the Luxembourgish village of Doncols. After heavy fighting, the 26th infantry “Yankee” division reached the so-called “Schumann’s Eck” on 30th December 1944. However, the 9th division of the Volksgrenadiere were waiting, hidden in a wood. The fighting for this key patch of land raged for three weeks in bitterly cold, snowy conditions. Thousands died from the artillery and machine gun fire, as well as in hand-to-hand combat. This episode was the most bloody fought on Luxembourgish soil. On 2nd January, the 26th division advanced by around 100 metres before being blocked. They held these gains, but by 8th January the Yankee Division was exhausted, and had to be replaced by the 90th infantry division. The terrible battle wore on, with the 90th eventually taking the village of Berlé. Then, on 11th January, a night-time attack overwhelmed German fortified hilltop positions near Pommerloch and Schumann’s Eck. This enabled the pocket to be closed with an advance on Harlange. These operations resulted in many hundreds of deaths, all part of the effort to hold the line around Bastogne. 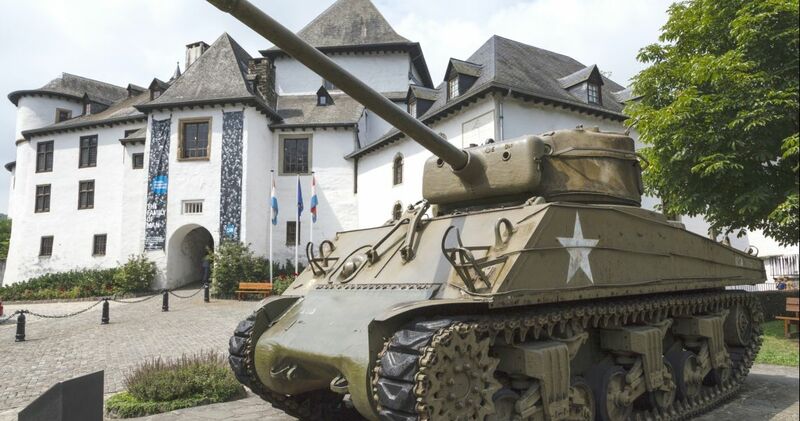 It was only on 21st January 1945 that the town of Wiltz was liberated by the 26th infantry division and the 6th cavalry group. The National Liberation Memorial at Schumann’s Eck was inaugurated on 13th September 1994, in the presence of veterans from both sides of the conflict. The path that takes visitors past many of these battle sites has also come to represent a memorial to reconciliation between European countries. Going from Schumann’s Eck, past trenches and other battle-scared landscapes brings the reality of war to light. American and German veterans regularly come together to commemorate the fallen; moments that help to raise awareness of the horrors of war among younger generations. 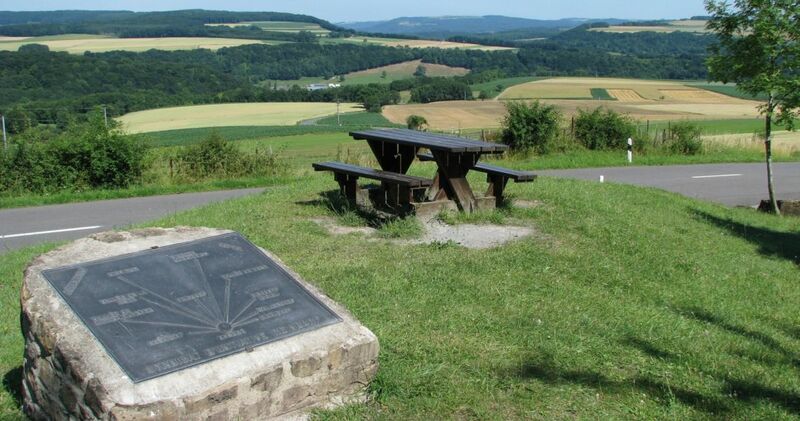 The “Bunker” hike starts at the “Friedboesch”, 2.4 km/1.5 miles outside the village of Schlindermanderscheid. Leaving in the direction of Oberschlinder, we come to Schlinder valley, the location of a small chapel dedicated to St Cunegonde built by local residents in 1858. After retracing our steps a few metres, we return to the main path through attractive woodland and by the places known as “Furebierg” and “Lannebierg”. After leaving the wood, we turn left along the main CR348 road, and 500m later we turn right towards the Wiltz river valley. We cross the well spot known as “Hoflay”, before walking past “Falkegeriecht” then arriving at “Gierschterbaach”. Then the path takes us near to the “Hockslay” view point that is 50m above the path, with its splendid views over the village of Kautenbach. If you look hard you will find remains of a Second World War bunker near this spot, but there are only few informations left about this hiding place. Returning to the path, we come to another view point, this time made from metal, and giving a panoramic view of the villages in the valley below. Then, continuing towards “Friedboesch”, we find a Second World War bunker which was restored in 2016. During the Nazi occupation, 17 members of the resistance and refugees fleeing the regime used an armoured underground shelter known as “Dosbaach”. In 1944, from the end of May until liberation day on 10th September, this bunker housed 17 people. They received supplies from the inhabitants of neighbouring villages, despite the risk of punishment if caught aiding fugitives. After a short climb, we arrive back to the start at Friedboesch. During the Nazi occupation, the resistance built underground bunkers to hide men fleeing conscription into the German army. 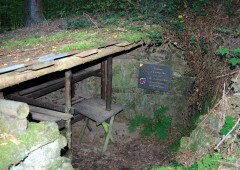 Five of these bunkers were used around Kaundorf. One, called "an der Runschelt", was restored in 1987 and has become a national monument. It was used during the summer of 1944 by four men avoiding the draft. They had previously hidden in the Nickels-Jans house. A commemorative plaque reminds us of the risks taken by the many patriotic citizens who helped their countrymen avoid conscription. This site is in a field and can only be reached on foot. From the village, follow signs for “Bunker” or “B”. A monument made from an old aerial bomb is located by Kaundorf village, in the direction of Esch-sur-Sûre. 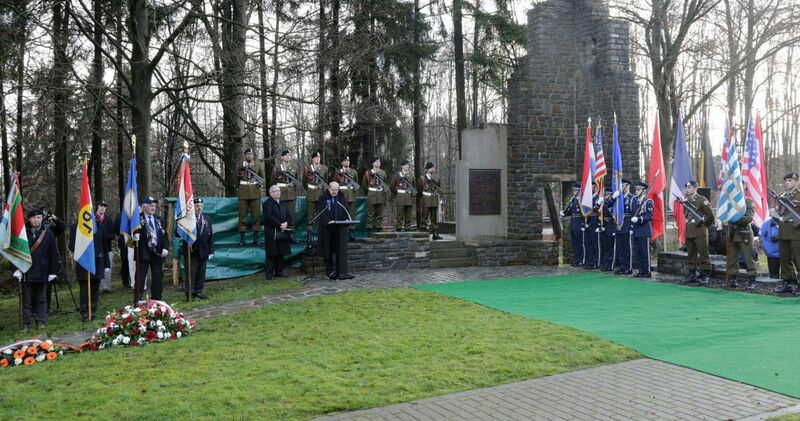 It commemorates the suffering of the local population and allied troops during the Battle of the Bulge. The bomb was dropped into a nearby wood by an American plane on Christmas Day 1944. This 8km/5mile hike takes in the Notre-Dame des Douleurs chapel in Bavigne. Just after the Battle of the Bulge, village residents had promised to give thanks for the allied victory by building this chapel in honour of the Virgin Mary. Eight years later in 1953 this work was completed, with three large wooden crosses and a chapel featuring a statue of the Virgin erected on a place called “Harelerberg”. Stone stations-of-the-cross leading to the chapel were added in 1957. As well, the “Op al Kierch” cross is accessible via a woodland path that links Sonlez, Berlé and Bavigne. An information board explains the story behind this cross. On 4th January 1945, Berlé’s priest was told to leave the village by the occupying German authorities. Forty residents subsequently set out into the snow towards the village of Doncols, but on their way they changed direction, and headed for Bavigne which was under American control. However, they encountered German troops who refused them passage, forcing them to seek refuge in a wood. It was here that the “Op al Kierch” cross was later erected, reminding later generations of this fearful episode. The original cross has been replaced twice by a copy. You can reach this site on foot from Berlé, by walking towards Espert. 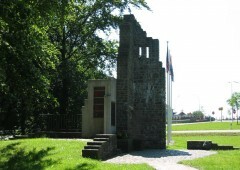 A monument next to Berlé church was erected in 1994 to honour the memory of all victims of the Second World War. This chapel was built to the memory of victims of the Second World War. It is located on a road just outside Harlange on the way to Bavigne. An interesting view from a rocky out-crop can be enjoyed just outside the village of Boulaide, in the direction of Bigonville. Follow the signs for “Hochfels”. A Second World War anti-tank gun and a field gun have been kept here since 1970. These two canons (one German, the other American) had been abandoned near the Poteau de Doncols crossroads. See the nearby wooden information panels for more details. Circular walk "Sentier des Passeurs"
This walk recalls the tragic events that took place here during the winter of 1944/45. Battlefield remnants and significant locations are described by 17 information panels. Significant action centred around Wallendorf, on the German side of the border with Luxembourg, at the point where the Sûre and Our rivers meet. On 11th September 1944 this village was taken by Combat Command R of the US 5th Armed Division, supported by units of the 112th Infantry Regiment of the 28th US Infantry Division. They thus broke through the German’s Siegfried Line defence, took many German villages before reaching Bitburg by 14th September. However, they had to withdraw after 20th September due to a lack of flanking protection and logistical support. By the start of October 1944, units of the 8th Infantry Division had established observation and listening posts on the Hoesdorf plateau, opposite the camouflaged “Westwall” section on the German Seigfreid Line near Wallendorf. At the end of November, elements of the 109th Infantry Regiment of the 28th Infantry Division relieved the 8th Infantry Division in this sector, conducting extensive patrolling activities. Early on 16th December 1944 a strong attack by the “352 Volksgrenadier” and the 5th German Parachute Division. They crossed the Our following a terrifying artillery barrage. Brutal, often hand-to-hand fighting ensued, resulting in heavy casualties on both sides. Thanks to the steep slopes of the Our valley, the outnumbered Americans were able to slow the German advance considerably until 19th December. Thus while the advance of the southern flank of the “bulge” had been stopped by Christmas Day, German units controlled the Hoesdorf - Bettendorf – Longsdorf plateau. They held this sector until the end of January 1945, when General Patton’s 3rd Army pushed them back to the original 16th December position on the Westwall. In early February 1945, units of the 80th Infantry Division crossed the Our at the Hoesdorf plateau, thus breaking through the Siegfried Line. 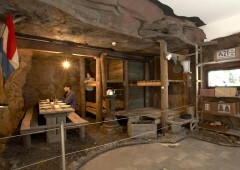 The Hondsbësch path links the “Espace Muséologique” museum in Lasauvage with the old Hondsbësch mine tunnel in Niederkorn. The circuit starts near the Hondsbësch monument in the avenue de la Liberté in Differdange-Niederkorn. 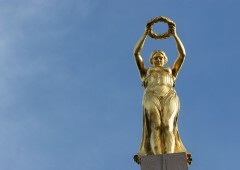 This monument dates from 1945, and was created by the Luxembourgish artist Claus Cito. It pays tribute to the memory of all the young people who, with the help of the civilian population and the resistance, escaped obligatory military service with the German army. 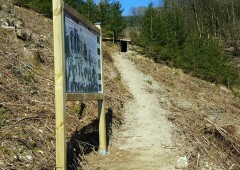 The entrance to the old Hondsbësch mine is in a forest, thus making it an ideal refuge. A total of 122 people hid there, whether they were seeking to avoid the draft, were conscripts who refused to return to the front after leave, or were members of the political opposition. Hondsbësch tunnel was also a starting point from which “passeurs” would help people escape to France and Belgium via secret pathways. Some fugitives made it as far as Great Britain, Switzerland and Tunisia. Lookouts we placed near this functioning mine to warn of any approaching German soldiers. Other courageous helpers provided food, drink and other supplies to those being hidden. 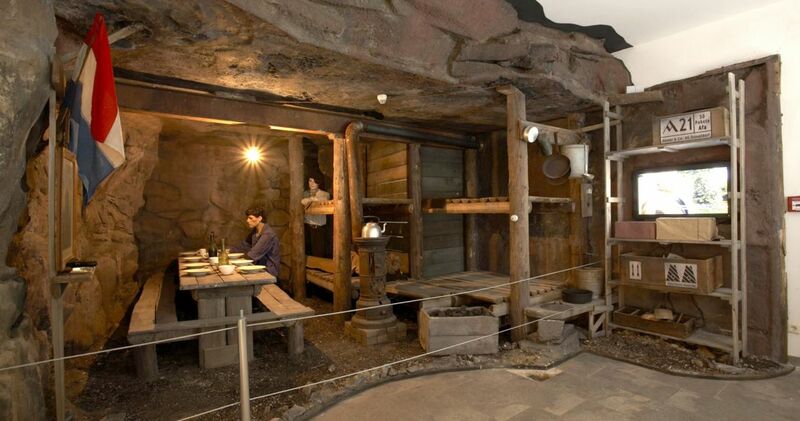 The Espace Muséologique in Lasauvage details this period of history though contemporary documents and photos, as well as numerous objects used by those living in secret. Information boards also tell these stories in the words of those who took part in these brave acts of resistance. The Espace Muséologique is open on Sundays and public holidays (except 23rd June) from May to September from 14.00 to 18.00. 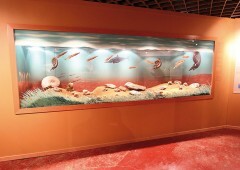 Visits to the exhibition can be organised on request. This city tour on foot takes in the capital’s main Second World War historic sites and memorials. You can follow the tour using a leaflet available from Luxembourg City Tourist Office, or by hiring an experienced guide. The Wehrmacht began its invasion of Luxembourg, Belgium and the Netherlands on 10th May 1940. Grand Duchess Charlotte of Luxembourg, her husband, children, and members of the government fled into exile via France, Portugal, the USA, Canada and finally the UK. All but one member of the government managed to escape, setting up in exile first in Montreal, then in London. The decision of the sovereign and the elected representatives to join the allies and resist Nazi occupation was crucial. It was central to Luxembourg’s ability to maintain its independence after the war. Twelve emblematic memorial sites have been selected for this tour, all of which are easily accessible by foot. These include the town hall, the place d’Armes where the “Gauleiter” (the Nazi governor) first appeared in public, the Grand Ducal palace which became a “Stadtschloss” (city palace) and a “Stadtschenke” (city café), and the Cathedral (a refuge for those seeking comfort from Virgin Mary, the country’s patron saint and the consoler of the afflicted). 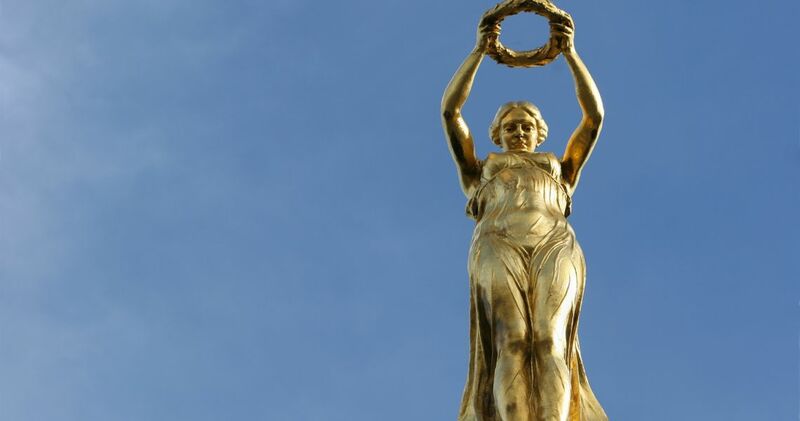 The statue of Grand Duchess Charlotte commemorates Luxembourgish independence, the decision to join the allied cause, and the country’s post-war role helping to build a new Europe. There is also the National Solidarity Monument (a brutalist architectural structure of the early 1970), the Remembrance Monument (on the place de la Constitution), a marker for the path taken by the liberators, and Villa Pauly (the ex-Gestapo HQ). The route crosses the place des Martyrs before reaching the site of the synagogue destroyed by the Nazis in 1943.